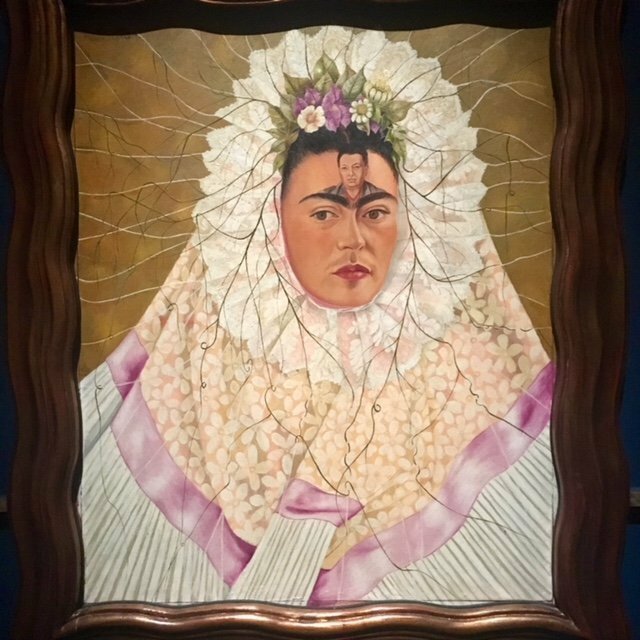 It was about time this Brexit-plagued country got an injection of vibrant colour and a sense of creative stoicism – and here it is, courtesy of a spectacular exhibition at the V&A – Frida Kahlo: Making Her Self Up. The genesis of the exhibition was a locked bathroom in her house which, for 50 years after her death, remained closed on the orders of her husband, the great muralist Diego Rivera. Then, in 2004, came the Open Sesame moment. Out tumbled 6,000 photos and 22,000 documents, plus 300 personal items, many of which form a touching part of the exhibition. Frida died in 1954, aged 47, Diego in 1957, aged 70. 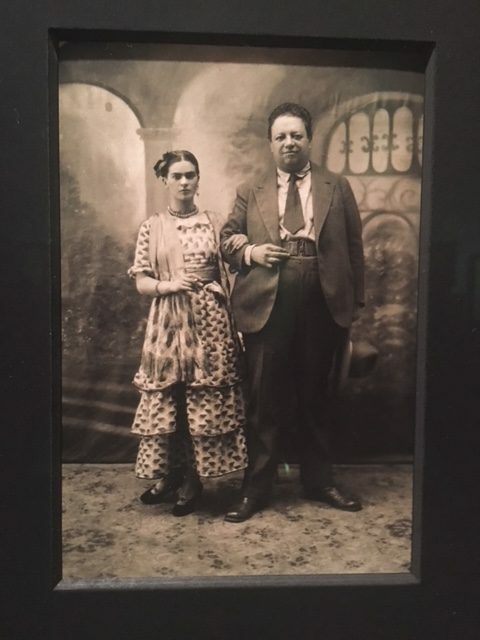 Their relationship was hardly harmonious; each had his or her lovers (Kahlo even had a fling with Trotsky, while Rivera was a serial womaniser) and it was plagued by break-ups. But between the volatility there was mutual adoration and respect. 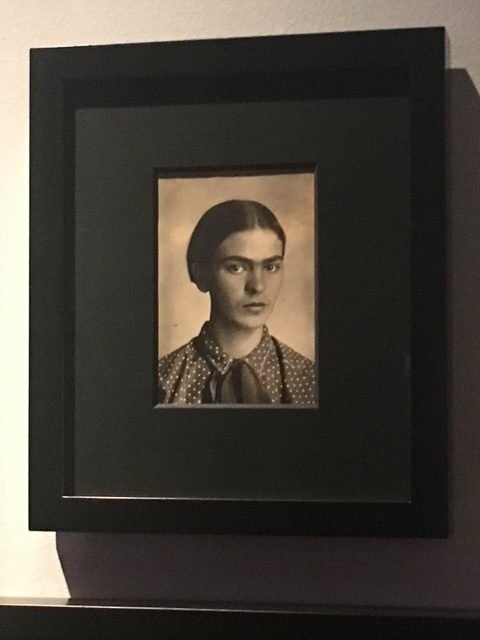 At the V&A, Rivera remains a shadowy background figure allowing the vibrancy and courage of Kahlo to come to the fore. Childhood polio followed by a tramway accident in her teens meant that she led a life of endless pain – which ultimately nourished and inspired her strange art. “Making Her Self Up” cannily refers both to her creative projection of her image and to how she actually used make-up – in this case Revlon nail varnish and lipstick. 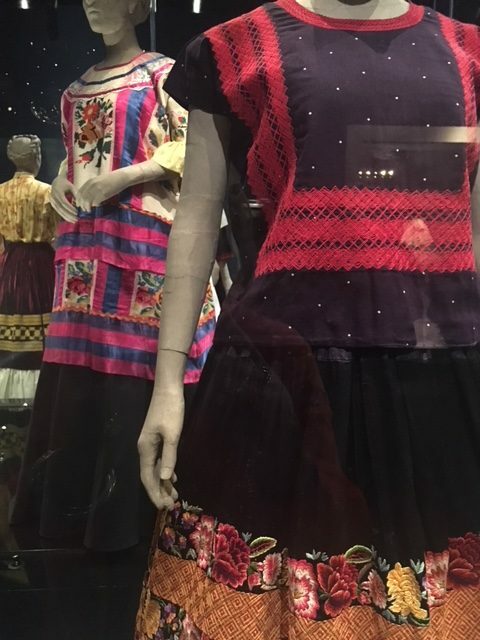 Such frivolities aside, what this exhibition shows is the context of her life – from la Casa Azul (her childhood home where she later died) to her glamorous fashion style in huipiles, traditionally embroidered Tehuana dresses (above) from Mexico’s Isthmus region. Her jewellery is displayed too as well as arresting black and white photos of Kahlo by photographers such as Lola Alvarez Bravo, a close friend, Imogen Cunningham, Gisele Freund and Kahlo’s American gallerist and lover, Julien Levy. The earliest portrait of her, aged 16 (above), is by her father, Guillermo Kahlo, a German immigrant. And of course her inimitable paintings are there too, many of which are self-portraits referring to the immense pain she underwent. 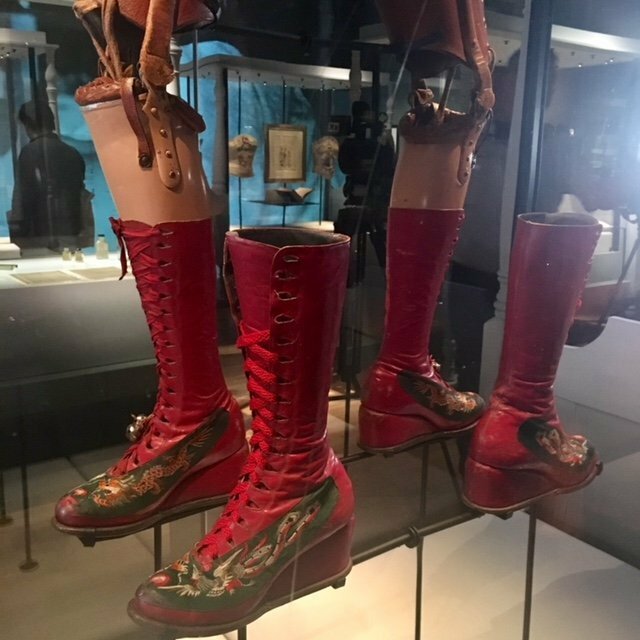 Here too are the ex-votos she collected, the prosthetic leg (above, duly decorated and with bells attached) she had to adopt after amputation one year before her death, and the plaster corset she had to wear during long agonising days spent supine in her four-poster bed. 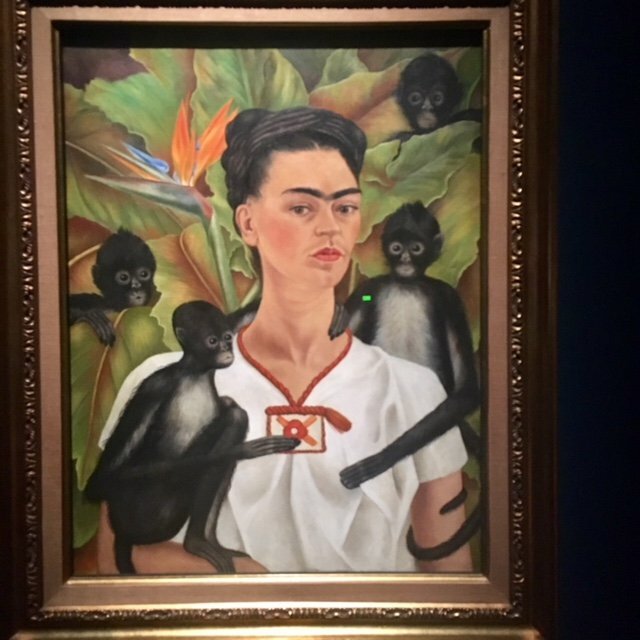 Of course the corset, too, was hand-painted with a hammer and sickle – both she and Rivera were militant Communists, very typical of Mexico’s intelligentsia of the 1930 – 1940s. So here we have an incredible vision of an extraordinary woman which is no doubt a revelation for many. 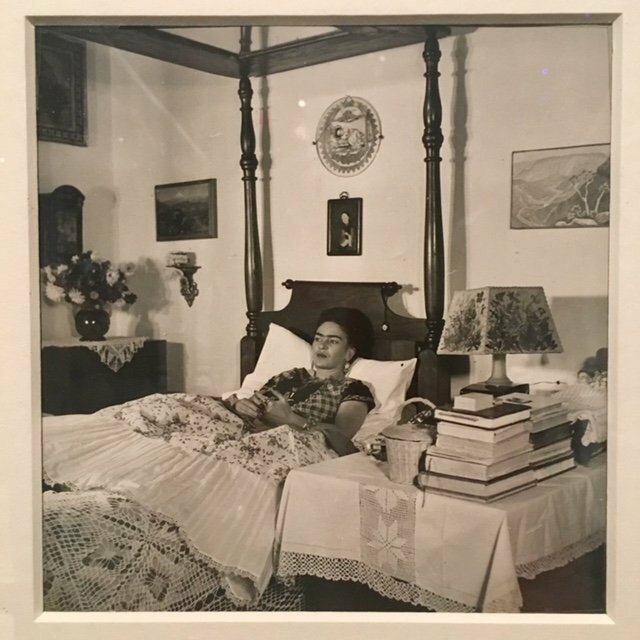 For me it whisked me back to Coyoacan, the prosperous suburb in the south of Mexico City where Kahlo grew up, later lived with Rivera and eventually died. 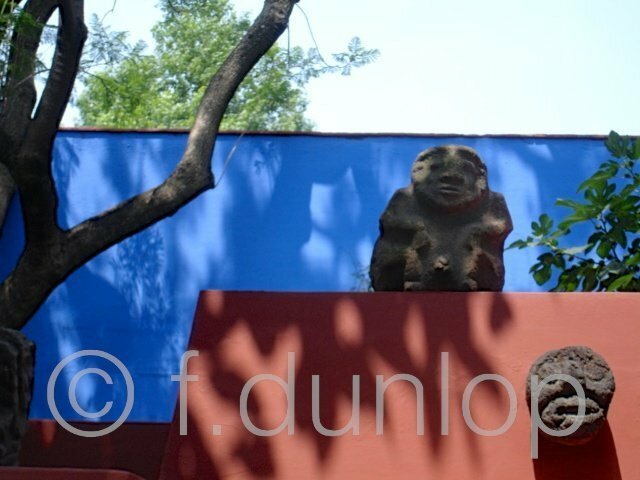 La Casa Azul is now a museum in her memory – unfortunately no photos allowed inside, so all I took away is this pic of the cobalt blue courtyard dotted with pre-hispanic sculptures that the couple avidly collected. 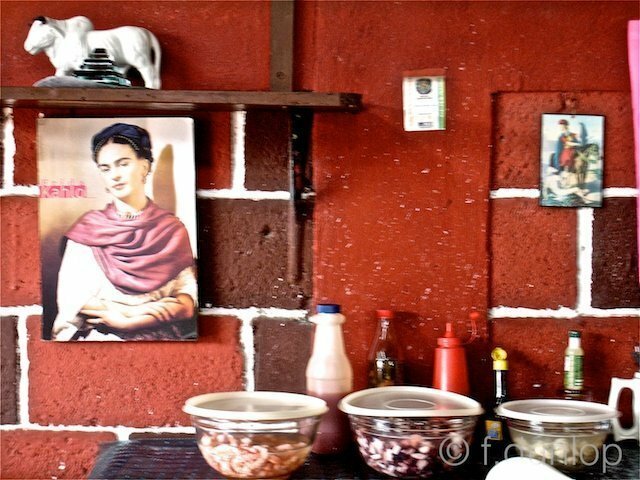 And to end, here is another blast of colour from Mexico – a country where it seems the skies are never grey – and where, even in the corner of a little food market up in the hills of Veracruz, among bottles of chilli sauce and bowls of food, Frida Kahlo’s inimitable image lingers.